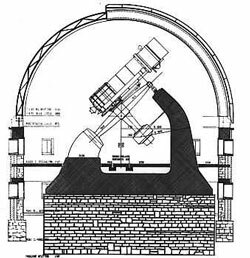 The 122cm telescope of the Asiago Astrophysical Observatory was built by the firm Officine Galileo in Florence between 1940 and 1942. It was dedicated to Galileo Galilei on the 3rd centenary of his death. The primary mirror has a parabolic shape with an effective diameter of 120 cm and a central hole of 19.5 cm. Originally coated with silver, it is now coated with a film of aliminum. The coating procedure is carried out periodically using the vacuum bell located in the workshop of the dome of the 180cm Copernico telescope in Mt. Ekar, Asiago. The secondary mirror can be a 45° elliptical plane mirror when the Newtonian configuration is required, or a hyperbolic convex mirror to obtain the Cassegrain focus, which forms the image at about 84 cm behind the reflecting surface of the primary mirror. All mirrors are made of pyrex glass. The Newtonian focus can be reached by the observer by means of a moveble platform fixed to the sides of the slit of the dome. 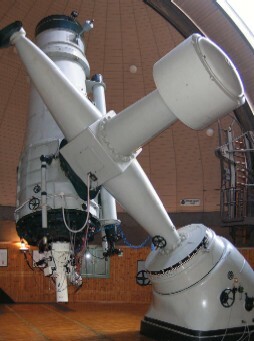 The equatorial mount is of the English type with north and south piers supporting a polar axis with the tube offset and short declination axis. The north pier does not allow the full sky coverage around the pole. The telescope has a completely enclosed tube; the entire upper end of the tube can be rotated around the optical axis for ease of observation at the Newtonian focus. The rear end of the tube contains the adjustment system for the primary mirror cell. The latter is supported axially by 18 pads and radially by a system of 24 lever counter balance units equally spaced around the cell. The mirror cell is created using a variable iris diaphragm. The dome has an external diameter of 15 m and an internal one of 14 m. It has a slit of 3.7 m.
The Cassegrain focus of the telescope is equipped with a Boller & Chivens spectrograph. 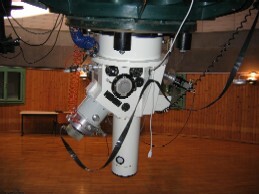 The spectrograph was made by Perkin Elmer (mod 58770), and installed at the 180cm telescope in Mt. Ekar. In 1998 the B&C was moved to the 122cm. A long-slit with aperture variable up to more than 1 mm and a length of 28 mm, is located at the Cassegrain focus focal plane. The side of the slit turned to the incoming light beam has a reflecting surface. An off-axis parabolic mirror with a diameter of 90 mm and a focal length of 810 mm (f/9) serves as beam collimator to the grating. A set of 4 gratings with a dispersion range from 42 Å/mm up to 339 Å/mm are available. The dispersed light beam is directed to the Dioptric Blue Galileo Camera, having a focal length of 188 mm and currently coupled to the Andor iDUS 440A-BU 512 x 2048 px CCD. In addition, some colored filters, located between the slit and the collimator are used to separate the orders in the red spectral range. An hollow cathode Fe - Ar comparison lamp is permanently installed to perform wavelength calibration. Finally, the reflecting surface of the slit, which images the focal plane of the telescope is monitored by a Proxitronic SONY guiding camera, which has a nominal sensitivity of 1 lux and cover a field-of-view of 4' 50" x 3' 20". The spatial scale of the instrument over the CCD camera is 1.25"/px. The new control room of the telescope, renovated in 2002, is located at the ground floor of the building. It is equipped with modern and powerful computers dedicated to the acquisition of data from the CCD and to the guide system. A special consolle is used for telescope movements, and to switch on/off the comparison lamp and flat field lamps. Another PC station is dedicated to data storage and contains the astronomical software for data reduction and analysis (IRAF, MIDAS, etc.). Other four computers are used for lab courses and outreach activities. A projector is connected to one of them for lectures, conferences, etc. All these computers work under Linux system. - Educational and outrech activities for the schools and the general public. 2. Access to the Control-Room is supervised by F. Di Mille e V. Mezzalira. 3. Computer stations "control-1", "control-2" and "control-3" are reserved for telescope control and data acquisition. 4. "Control-3" station is equipped with astronomical software and can be used only by authorized personnell. 5. 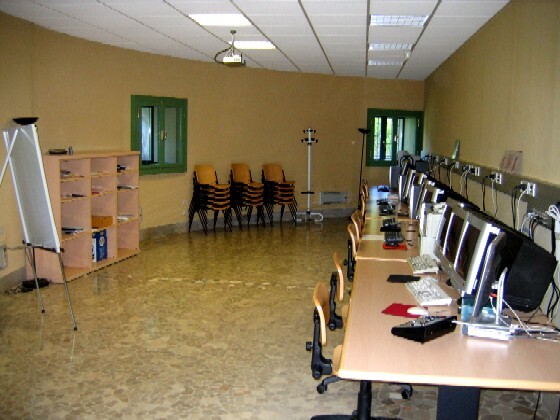 Computer stations "control-4", "control-5", "control-6" and "control-7" can be used also for didactic and educational purposes. They only have the operating system and upload the astronomical software from "control-3", which consequently must never be shut down. 6. It is strictly forbidden to download and/or install software unless authorized by the system manager V. Mezzalira. 7. Accounts are created on request by the supervisors and must be approved by the Director. 8. All accounts and their content will be deleted a week after discontinuing their use.